Nicotine shots are generally used with Short Fill E Liquids, which tend to contain no nicotine. Adding one 18mg nicotine shot to 50ml of e liquid will give you 3mg overall. However, by altering the amount of nicotine shots you add to your e-liquids you can tailor them to your specific tastes. Want to know how to get 6mg nicotine strength in a 50ml shortfill, for example? Refer to the nicotine shot calculator chart below to find out how many nicotine shots to add to various volumes of nicotine free e liquid to get to your desired strength. Please note that the below recommendations are based on a 10ml nicotine shot at 18mg strength. The Tatts, Academy and Hipstar short fill e liquids by OK are 50ml of juice in 60ml capacity bottles. 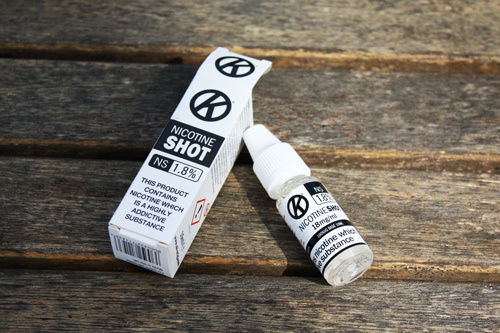 To make these e liquids up to 3mg nicotine strength, simply add one of our 10ml nicotine shots (18mg). If you would like 6mg nicotine strength in your shortfill e liquid you will need to remove some e liquid from the bottle. An easy way to do this it to got an empty, 10ml bottle and squeeze out enough e liquid from your short fill to fill the bottle. You will then have enough space to pour in two 10ml nic shots which will give your e liquid 6mg of nicotine content.